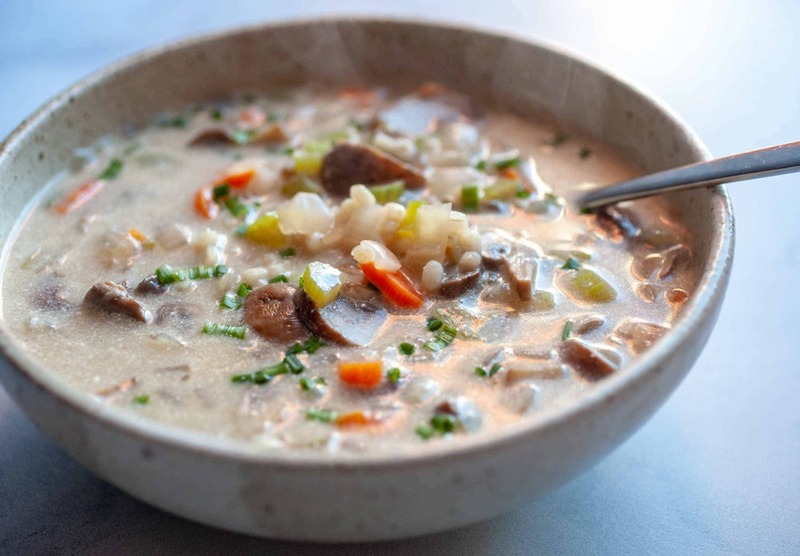 This creamy vegetarian mushroom barley soup is packed full of whole grains and veggies in a creamy (but not too heavy) soup. It’s a perfect bowl of soup for a cold winter day! 1) In a medium pot, add the barley along with 1 1/2 cups chicken stock. Bring to a simmer, cover, and simmer over low heat until barley is tender, about 25 minutes. Remove from heat and fluff with a fork. 2) In a larger pot, melt butter over medium heat. Add mushrooms and a pinch of salt. Cook until mushrooms lose their liquid and start to brown a bit, maybe 6-7 minutes. 3) Stir in onions, carrots, and celery and cook for another 4-5 minutes until veggies soften. Season with another pinch of salt and pepper. 4) Add flour to the veggies and stir in. Cook the flour and veggies for a minute or two to cook off any flour taste. The flour should turn a light tan color. 5) Slowly stir in the remaining chicken stock (2 1/2 cups) and bring to a slight simmer over medium heat. Cover and simmer for 7-8 minutes to meld flavors and thicken soup slightly. 6) Stir in cooked barley. Remove from heat and stir in sour cream. Taste and season to your liking. 7) Serve soup while warm garnished with fresh chives. This delicious recipe was brought to you by Macheesmo. Read the full post at https://wp.me/pkSYO-35Y.